The Jungle Teacher: I ♥ Ramadhan Bazaars! I absolutely love Ramadhan Bazaars! 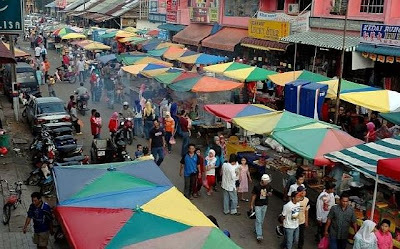 Every year I look forward to visiting one of these daily glorious Malay food fairs! The best of Malay cuisine are not to be found in exquisite exclusive expensive boutique diners. The best of the best is always born out of years of trial & error in the humble kitchens of everyday makciks! And just for 30 days a year, these sweaty chubby golden girls share their works with you at a token price of what these priceless creations are worth! Step into one of these carnivals that can be found all over Malaysia (even in Sibu, Sarawak!) during the Holy month of Ramadhan & breathe in the festivities. Watch as families, teenagers in school uniforms & senior citizens walk from stall to stall counting their money & wondering what delights they will find in the next stall. Sample the stalls yourself & you'll find Roti Jala, Kek Lapis, Kari Paf, Tempeh, Agar-Agar, Leko, Ayam Masak Merah, Kari Ayam & Sambal Ikan Billis just to name a few! However, the beauty of a Ramadhan Bazaar is not found only in the food. It can also be found in the people. People of every skin colour, language & social background are welcome to the same location & pay the same price for the same food. Nobody is special there. Everyone is treated as Malaysians.